Rocco’s New York-Style Pizza has been on my radar for a long time. We have great pizza in Tokyo, like the classic Italian Neopolitan style, cooked in wood-burning ovens, as can be found at the famous Nakameguro Seirinkan. 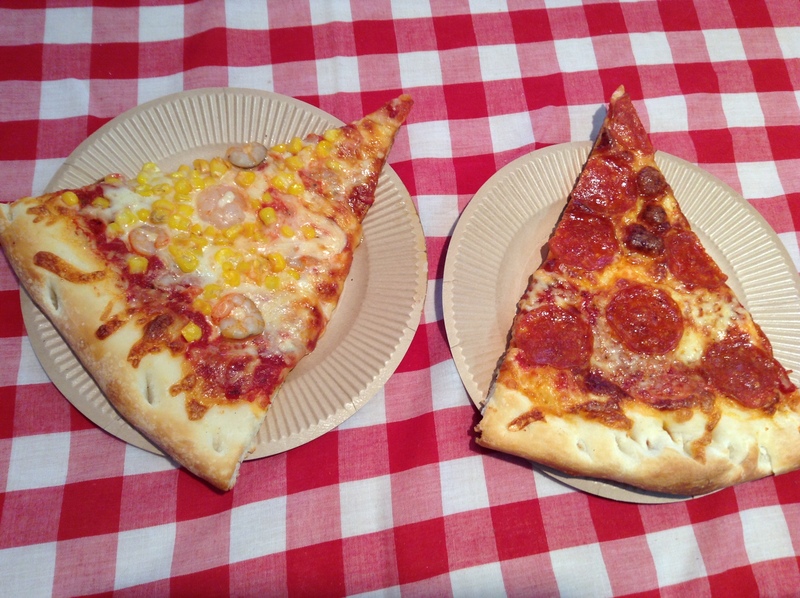 What is harder to find is the New York-style, baked in a deck oven, and sold by the slice. Toppings are what I often crave like pepperoni, Italian sausage, and olives, items that aren’t traditionally put on the Neopolitan pizzas. Rocco’s is just a short walk from Oji station, an area that is not part of my regular routine. I am thrilled to have finally made it as Rocco’s pizza reminds me of my years in New York City. Big slices that fall over the paper plates that are right out of the oven. The tables are lined with red-and-white checker cloth. Grated cheese, chili flakes, and powdered garlic condiments are also on the table, another nod to New York. There is a full menu, including calzones, Buffalo wings, and New York cheesecake. We didn’t have much time this day but will definitely go back to try more of the menu. The owner, Dan, is from New York, and I was thrilled to be able to catch part of a New York Yankee’s game on the big-screen television. The sports schedule is listed on their website. While Oji was not an area I went to often the past, I see that changing. This pizza is worth a journey.